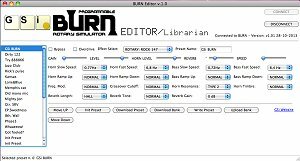 November 03, 2013 BURN Editor / Librarian released! Seems incredible how many things can be done with a small box like the BURN! Not only it's a killer rotary simulator, it is a multi effect and a totally programmable versatile unit. And now its possibilities are further expanded thanks to the PC Editor/Librarian, which will allow the user to edit, organize, backup, restore and share their presets. The Editor can be used either online (BURN connected via MIDI) or offline (BURN not connected). Everything you do when the program is online is automatically reflected to the BURN. And if you don't have a BURN yet, you can try the Editor just to discover how a preset is organized and which parameters you can customize.